This essay, written by Patty Konigsfeld, has been recognized as one of the top finalists in the 40th Anniversary Samaritan Memories Essay Contest. Since I gave my life to the Lord, I have been on one exciting adventure after another. My life is one of following the Lord . . . wherever He leads me I will follow. My husband and I have been involved with GSM Ministries and the Pakistan Satellite team since 1991. We have visited Pakistan twice and with God’s support have partnered with the people in Pakistan to educate the Muslim and Christian children. Through the work of GSM, many schools have been built for the children and sewing schools provided for the young women. One of my most exciting memories with GSM was the opportunity to meet the Prime Minister of Pakistan Benazir Bhutto. I found it incredible that a woman was in power in a male dominated country. In preparation for meeting Benazir Bhutto I read her autobiography, “Daughter of Destiny.” I am a very slow reader. But I persevered and finished reading her book! I was so proud of myself and felt ready and prepared to meet her. I had thought and hoped that I would meet her the first time I traveled to Pakistan in 1998 with Bettie Mitchell, the founder of GSM. I was very disappointed to learn that Benazir Bhutto was removed from office a month before we went to Pakistan for something her husband did. I knew that God would set up another time for our meeting. Six years later (after my first trip to Pakistan), the prophecy came to life. This is how it happened. After Benazir Bhutto gave the closing prayer, God cleared the crowd for Mike to personally share our work in Pakistan with her. She told him she wanted to meet Bettie Mitchell and the Satellite Team who had a passion for serving the people of Pakistan. Being a part of this miracle began when I picked up my phone to hear Bettie on the line. 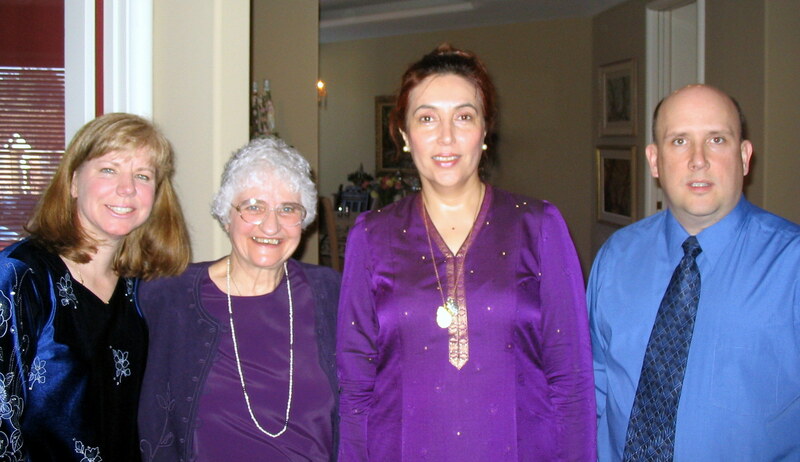 She was so excited to invite me to a brunch with Benazir Bhutto in a home in Tigard, Oregon (so close to my home). Isn’t it marvelous how God works! He promised we would meet and I was excited it would be in Oregon. This was prophecy being fulfilled. A few days later I found myself sitting at a table next to Benazir Bhutto. Across from me was Bettie Mitchell surely two women with much integrity. I knew that there were 12 other people at the table with us but I felt as if the three of us were in a spiritual bubble! Benazir was soft spoken and I found her to be quite down to earth. We had a brilliant conversation. She talked about her political party and how they felt like victims. Once Bettie sensed victimhood, she spoke life back into Bhutto’s soul with encouraging words. Benazir shared with us that her whole political party needed this encouragement. Bettie took the God assignment and had many conversations with her before she was murdered for her love for Pakistan. We had to wrap up our time and leave before the media came. I was able to share with her my creative memory picture book of our GSM schools in Pakistan. She was amazed at the work being done in and for her beloved Pakistan. She could not believe that there are Americans who love and care about her people of Pakistan as she does. I shared with her that I knew I would meet her with Bettie. I told her that I felt like I knew her already from reading her book. I thought it was going to be six years earlier but I am thrilled with God’s timing. We ended our time together by praying over her. When we left, I felt like we were radiating with God’s gift of joy! This was a profound and glorious meeting. God is great! A great woman of God was brutally taken from us. She shared how important education is to change a nation. This was her father’s main goal when he was Prime Minister and she was going to carry on his legacy (Education). Benazir shared her love for the people of Pakistan. I truly believe she would have been re-elected by the people to lead Pakistan forward. Now I am reading her book “RECONCILIATION” (Islam, Democracy, and the West)” that was released after she was killed. During our meeting, we had shared and agreed that education is the key for change. I am hoping to go back to Pakistan and keep her legacy going and her story alive. “RECONCILIATION”! I am so inspired by the inspirational work that both of you are doing with the others in Good Samaritans in Pakistan.